File contains images of a Kodak men's curling team, a woman golfing, and a woman snapping a photo of guards at the Palace of Westminster. File contains promotional images of men apparently popping out of slifes holding a screw like object on display. Additionally, there are images of Kodak products such as Kodacolor 110 film, FunSaver one-time use cameras, and slide projectors. File contains transparencies featuring promotional images of 35mm film, motion picture film reels, photographic processing and t-grain film cyrstals. File contains promotional images of different kinds of Kodak Motion Picture color negative film in film cans on a blue background. Item is a colour transparency featuring an image of a child holding a lollipop. Likely a promotional photograph for Kodak colour film products. Item consists of three copies of a promotional write-up on Kodak Canada Inc.'s manufacturing achievements. This file contains poster for the lecture, Prelude to Genocide : The Jewish Persona in the European Imagination. Item is an illustrated colour guide for general picture taking and a promotional brochure for a range of Kodak still and motion picture cameras, film, movie projectors, and other photography accessories. File includes promotional material for the Sharp RD 671-AV and 771-AV cassette recorders. Item is a promotional pamphlet for Tecnifax overhead projectors published in 1967. Past preserved, future defined : 1899-1999 = Un passé préservé, un avenir défini :1899-1999 / Kodak Canada Inc. 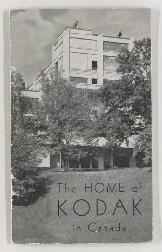 File consists of 3 French and 3 English copies of an illustrated colour promotional brochure detailing Kodak Canada's history, philosophy and products. 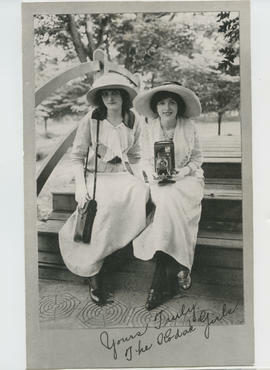 Published to celebrate the centennial of Kodak Canada. Item is a promotional brochure detailing Eastman Kodak's environmental sustainability initiatives. Kodak Canada and the environment / Kodak Canada Inc. Item consists of two copies of a promotional brochure detailing Kodak Canada's environmental sustainability initiatives. Item consists of three copies of an illustrated colour brochure for Kodak Canada's capture, transformation and display products for analog and digital photography. Item consists of two copies of a brochure for Kodak Canada's photographic, commercial, information, scientific, chemical and drug products. A sharper portrait of Kodak = Une image plus nette de Kodak / Kodak Canada Inc. File consists of 3 French and 3 English copies of an illustrated colour promotional brochure detailing the products and services offered by Kodak Canada Inc. Item is a promotional pamphlet describing Kodak's business- and consumer-related organizational units. Includes an organizational chart. Item consists of 3 copies of an illustrated black-and-white promotional brochure detailing the history of Eastman Kodak Co. Contains a biographical sketch of George Eastman. Item is an illustrated colour brochure of Eastman Kodak's facilities in Rochester, NY. Item is a promotional brochure detailing how Eastman Kodak Company acquired its trademark name. Item consists of three copies of an illustrated colour promotional brochure detailing Kodak's global operations. Item consists of 3 copies of an illustrated promotional booklets detailing the history of Eastman Kodak Co. Published to celebrate Eastman Kodak's centennial. The history of Kodak Canada Ltd. / Kodak Canada Ltd. Item is a promotional brochure profiling Kodak's Canadian operations. 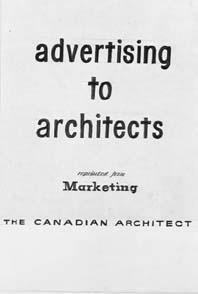 Includes historical images of Canadian Kodak's facilities and war efforts. Item consists of two copies of an illustrated promotional booklet featuring significant milestones in the history of Eastman Kodak Co.
Kodak in Canada / Canadian Kodak Co., Ltd. Item in an illustrated colour brochure promoting Kodak's operations in Canada and the world. Item is an illustrated black-and-white promotional brochure for Eastman Kodak's facilities in Rochester, NY. Item is an illustrated profile of Eastman Kodak's facilities and history in Rochester, NY. Item is a black-and-white promotional brochure for Canadian Kodak Co., Ltd's plant and facilities in Toronto. The secrets behind Kodak Canada's consistently outstanding performance / Kodak Canada Inc. Item consists of 3 copies of a brochure promoting Kodak Canada to the business market. Item is an illustrated colour promotional brochure for Kodak Canada's image and data management products and services for the business market. Kodak Canada : confidence that comes with trust / Kodak Canada Inc. Item consists of 2 copies of an illustrated colour brochure featuring Kodak products and services targeted to the business market. File consists of two illustrated colour brochures. Products featured include the Portra family of professional films and the Kodak Professional RFS 3600 Film Scanner. Item is an illustrated colour brochure featuring Kodak professional films and Hasselblad cameras. Item is an illustrated colour brochure outlining the goods and services offered to accredited Olympic photographers.